While she went on to become a noted marine ecologist, the administrator of the National Oceanic and Atmospheric Administration, Jane Lubchenco, grew up in Colorado, far from the ocean, she said during an interview last month at her office in the Commerce Department. She did not feel the lure of the sea until a college summer at the Marine Biological Laboratory in Woods Hole, Mass. Paul Voosen: What was it during that summer that hooked you? Jane Lubchenco: That was between my junior and senior years in college. The context is, I grew up very much a tomboy, hiking and climbing and fishing and camping in the Colorado mountains with my family and Girl Scouts. But I also loved school, and I was intensely curious about the natural world. So I gravitated toward biology, although I liked physics and geometry and humanities. I liked everything in high school. And in college I was a biology major, although I was in a very nontraditional program. That's sort of another story. I didn't have any grades, I didn't have any tests, I didn't have any classes that I had to attend. It was an independent study program, but I was a biology major. Jane Lubchenco holds court in a rocky tidal pool, the marine environment where she made her early scientific name. Photo courtesy of Oregon State University. Most of what I had been exposed to was the terrestrial world. Then going to Woods Hole and the MBL [Marine Biological Laboratory], I discovered this whole new world that I didn't previously know even existed. It was a course in invertebrate zoology, and there are so many different kinds of invertebrates and they are so different from one another. Learning about how they work, what the differences are, all the different ways you can make a living or avoid predators or get food and the infinite variety. I just found it endlessly fascinating and thought, I want more. I was very comfortable in and around the water. I'd been a swimmer, a competitive diver, spent a lot of time every summer swimming in lakes and doing a lot of sailing. That part came naturally. But the class that I was in was, with the exception of two people, were all graduate students. I was in and around kids who were in graduate school talking about their experiences and it sounded like a lot of fun. The course was the first half of the summer and then each of the six professors chose one student to stay on for the second half of the summer and do a research project. I was chosen to do that. I worked on a little clam. It had a structure whose function was completely unknown. That was suggested to me as a project: figure out what this thing does. I discovered I liked the problem-solving nature of doing research. It was fun. I liked designing experiments. I liked analyzing the data. I liked writing it up. So based on that experience I decided, A) I wanted to go to graduate school, and B) I wanted to do something in marine biology. It was a turning point for me. Not that I hadn't liked other things before, but it was just really, "Oh, my gosh, this is cool!" Paul Voosen: This was all biology. Did you see yourself becoming an ecologist then? Jane Lubchenco: Not then. It was broadly based biology. When I went to the University of Washington as a graduate student, I was in a Ph.D program there and the zoology department at UW, at the time, was just a hotbed of cutting-edge science that was an interface between experimental ecology and evolutionary ecology. That combination didn't really exist anyplace else. Rocky seashores turned out to be a phenomenal model system to manipulate things. You can take predators away; you can cage things; you can transplant things. Instead of being limited to correlations and inferring causation, you could test that idea. And the folks that I worked with at UW were the pioneers in that. It wasn't just explaining current patterns by understanding the processes. It was also seeing them through an evolutionary lens: How did these come to be this way? With the larger questions of why do you see different patterns different places in the world? Why are the tropics more diverse than temperate areas? There were a lot of burning issues in ecology and the experimental approach, especially rocky seashores as a model system, answered a lot of questions, and opened up more, because that's the way science is. Paul Voosen: Those rocky seashores -- was that part of the reason you returned to Oregon State? Jane Lubchenco: I did fall in love with the Pacific Northwest. When I was at UW, I met the man [Bruce Menge] that I ended up marrying later. He was in his last year of graduate school when I was in my first. He finished his Ph.D and went to [University of California] Santa Barbara for a postdoc. So I took a leave of absence from UW and went down to Santa Barbara and did research for a year out on Santa Cruz Island, interacting with a different but equally energetic and exciting group of ecologists. And then when Bruce, after one year, took a position at the University of Massachusetts at Boston. So we got married, I finished what I had been doing as a master's student at UW and we moved to the East Coast to Boston. And I ended up doing my Ph.D at Harvard. In the course of my graduate school years, I was exposed to three very different sort of world views of ecology. Equally valid and exciting, but different. I gained a real appreciation that I think most graduate students don't get of how much, when you are in one place, you take on the assumptions of that place and that particular mindset and worldview. It was fascinating to be exposed to these different ways of asking questions or different assumptions you would make about how things worked. I was enriched by that diversity. So, we returned to the Pacific Northwest in part because I finished my Ph.D at Harvard. I was offered a job as an assistant professor. I took it. Bruce didn't really like the Boston area. He was a Minnesotan — he grew up in Minnesota and he never felt comfortable. Paul Voosen: Not the warmest people ever in Boston. Jane Lubchenco: Not the warmest people. Very aggressive and, even driving, it's a different world. At any rate, he had also fallen in love with the Pacific Northwest. But the real clincher for us was we both worked absolutely full-time and spent every moment either teaching or doing research. And both of us wanted to have a family and couldn't imagine where we were going to have time to do that. Especially since it was important to both of us that we spend a lot of time with our kids. We started looking around, proposing to universities something that had not been done, which is to take a single position and split it into two separate half-time, but tenure-track, positions. That had not been done and people had a lot of questions about it. Oregon State said, "Whoa, that sounds really interesting. Let's try it." So, we went to OSU, because they were willing to do something nontraditional, allowing us to both have a half-time, tenure-track position, independent of the other -- separate tenure decisions, separate promotion decisions. At the time, most of our friends who were scientists, the guy took the job and the woman stayed home with the kids and that was pretty much the way it was. But this was a much better fit for our philosophy and our loves. And OSU turned out to be a great place for that. We each were half-time for 10 years and then three-quarters time for another three years and then, when the department wanted me to be chair and our kids were old enough, we decided it was time to be full-time. Our older son was 10 at that point. 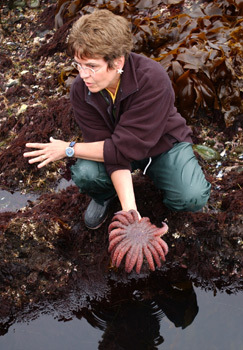 Jane Lubchenco: It was trying to understand the role that herbivores play in rocky shore communities and in ecosystems more broadly, by doing experiments. I did a lot of different experiments and studies along the shores of New England. I worked out at Nahant, but I also had study sites in many places in Maine, mostly downeast, so it was a gradient with respect to wave action. And the question was, what is the role of herbivores? One of the things I discovered, which is this one paper to which you are referring, found that this particular snail, Littorina littorea, has a keystone role in controlling the abundance and diversity of seaweeds in the tide pools where they occur. And I noticed the pattern that, if you look at a whole bunch of different tide pools at about the same tidal height, about the same size -- more or less the same physical factors -- you see different patterns. Some are dominated by a green alga. Others are dominated by a red alga. And others have a combination of the red and the green and a whole bunch of other things too. I was curious why that was and, at the same time, I was doing experiments to understand what seaweeds the snails preferred. What did they eat, what do they prefer? Then, as a side note, how are seaweeds defending themselves from herbivores? Are they unpalatable? Are they too tough? Whatever. In the foraging choice experiments, where I was giving them, in the laboratory, a choice of different seaweeds, I discovered that they really liked the greens. Browns were OK in general. I'm simplifying a little bit. The reds were pretty unpalatable. They wouldn't eat those at all. And I noticed that there was a correlation between the diversity of seaweeds in the pool and the abundance of the snails. Where the snails were very, very rare, the green algae dominated. Where the snails were intermediate in abundance, you got a high diversity of seaweeds. Where they were very, very abundant, you got just a low diversity again, dominated by the red algae. And so if you look at diversity, either measured by number of species or any one of the different ways people have devised to measure diversity, doesn't matter which it is, and you have the abundance of snails, you got a unimodal curve. So these are the pools are dominated -- low abundance of snails, low diversity. These are the greens. And it's because greens are competitively superior to the other seaweeds, and nobody is eating them, then they take over a pool. At the intermediate levels of abundance you get the highest diversity, because the snails are keeping the competitive dominant in check, that's opening up space for other seaweeds to also exist in the pool. And if the seaweeds are superabundant, then they're eating not only the greens, but the browns and everything else and leaving just the unpalatable ones. That relationship was a novel insight, even though when you explain things in hindsight it seems like no big deal, but at the time it was surprising. And it turns out there are other interesting twists to the story, because you might ask why would any particular pool stay with a particular set of conditions in terms of abundance of the snails. It turns out that there are gulls that prey on crabs, that prey on the baby snails. There are other pieces that help explain the dynamics that you see over time. But this was the basic pattern and the basic finding. I went back through all of the literature on plant diversity across not just marine systems, but terrestrial or freshwater systems and discovered that many times when people did a removal experiment, sometimes they did a removal and they saw an increase in plant diversity if they removed the herbivores. Sometimes, when they removed the herbivores, they saw a decrease in diversity. The literature was scattered all over the place and people didn't have any idea sort of what to make of it. But this relationship added significant insight into that, because if you start at this point and you do a removal, you're going to see an increase in diversity, initially. If you remove them, then you would eventually see the competitive dominants taking over. So you would actually go back through time through this trajectory. If you started here to do a removal, you would see just a decrease. Part of the insight here was when you do a removal in nature, it's useful to know whether you're starting at a really, really abundant level or starting at an intermediate level or starting at a low level, in which case you wouldn't see any change at all. So it helped interpret what appeared to be very confusing results from a lot of different manipulations that had been done globally with respect to herbivores. Paul Voosen: Looking at this kind of close experimental setup, this careful, well-designed thing -- and now you're leading an agency, and as you've moved through your career, you've worked on these systems that defy manipulation. You can't test them. How has this early work guided your response to these large systems like the climate and oceans? Jane Lubchenco: My own research trajectory has evolved from this very small-scale approach to one that is much larger in focus. Before I came to NOAA I was leading teams that were looking at understanding the workings of nearshore ecosystems, especially those in areas where there's something called coastal upwelling. Trying to understand how they work, how they change, how to do a better job of managing human activities that affect them. That's a pretty far cry from tide pools. It much larger in scale, more interdisciplinary, because I was collaborating with physical oceanographers, with geneticists, with social scientists -- larger in scale, interdisciplinary, more long term. Coupling observations and research and communications and focusing on relevance to various policy issues. How can we use the knowledge that we have about nearshore systems to adapt to climate change, for example? A whole set of policy relevant questions. Some people, during their careers, evolve. One set of questions leads to another to another. Jane Lubchenco: In my case, the questions lead from small scale to larger scale, more complicated, more interdisciplinary. And I always seek out opportunities to learn new things, to work with new people, to discover new things. I like learning new things. And during the course of my career, it became obvious that many of the systems that I and my friends were studying were changing before our very eyes. So I was motivated to find answers that would be helpful to policy and management decisions. I had spent a lot of time leading various efforts within the scientific community to share information with the public, with policymakers and others. I was no stranger to Washington. I had spent a fair amount of time here before, in the guise of National Academy business. I was president of AAAS [American Association for the Advancement of Science], president of the Ecological Society. And in all of those it's the science policy, science management connection that is important. Promoting science, but also encouraging scientists to share what they know in ways that are relevant and understandable to policymakers. Paul Voosen: Do you remember when in your work that you started to see that climate signal? Jane Lubchenco: It's probably not only a climate signal. Though there probably is a climate signal there, but there are a lot of environmental changes that are under way, depending on where you are. For example, I taught a course in coral reef ecology at the Discovery Bay Marine Lab in 1977, probably, '76 or '77. Then 20 years later I was there again diving on the same coral reefs where I had done research and had taught a course, an extended course during a summer. And that system had been completely changed from an incredibly beautiful, diverse, magnificent coral reef, very three-dimensional, spectacular coral, spectacular sponges, into pretty much a weedy wasteland through a combination of overfishing, land-use changes, sedimentation. And there was a disease that swept through the sea urchins in the system. Those environmental changes made this coral reef much less resilient to a hurricane that came through, and the hurricane had trashed it. But instead of coming back, which is what reefs typically do, there was no resilience in the system. The herbivores that had been successively knocked out, so overfishing of turtles, overfishing of whitefish, overfishing of crabs and then the disease knocked out the herbivores -- the sea urchins. There were virtually no functional herbivores in the system, so seaweeds grew all over the coral and kept the coral from coming back. Most of the environmental changes I saw in many of my systems were a combination of factors, depending on where you were. Different things in coral reefs versus rocky seashores, for example. Paul Voosen: Is that part of what prompted the article you had in Science in the mid- to late 1990s that showed the human touch on environment everywhere? Jane Lubchenco: Yup. That was done with three other colleagues. It was an attempt to provide some credible scientific syntheses and analyses of global patterns that many people had thought were probably out there, but nobody had pulled together all of the information. Part of what we showed was that there is virtually no place where you're not seeing some very strong signal of what's now been named the anthropocene -- that term wasn't out there at the time, but it was the same idea. It said that humans have increased carbon dioxide by 30 percent since the beginning of the Industrial Revolution, with double the amount of nitrogen that's available on an annual basis. More than two-thirds of major fisheries are fully fished, overfished or exploited. What were some of the other patterns? There were a whole series of major sort of phenomena like that for which there was enough credible data in the peer-reviewed literature to pull together and indicate, you know, what is the anthropogenic signal here? And that's the paper -- Peter Vitousek, Hal Mooney, and Jerry Melillo and I wrote that one. Paul Voosen: Obviously the anthropocene concept has gained a broad circulation -- National Geographic has features on it. Is it important for the public to have that concept? Jane Lubchenco: It is. We live in a human-dominated world. The underlying assumption that many people make is that the natural world, let's take oceans as an example, are endlessly bountiful and endlessly resilient. We continually struggle against that notion. For oceans in particular, it is hard for people to appreciate how something that is so immense could actually be affected by human activities, especially when we just live right along the coastal margins. In the '60s the mantra was "the solution to pollution is dilution." Well, what could you ask for as a huge potential opportunity for dilution than the whole ocean? The reality is that it is we have depleted many parts of the ocean and have significantly affected its resilience. And as we think about smarter management -- as we think about ensuring that we have the benefits we want from natural ecosystems -- we need to be cognizant of the impact that we're having on them. And this concept of ecosystem services, the benefits that we get from ecosystems, is a very powerful one. We are dependent on the life-support systems of the planet. And thinking about trade-offs, using ecosystems or creating ecosystems, to understand those trade-offs better is important. Just look at a mangrove. If you are thinking about converting a mangrove to a shrimp pond, if you live in Thailand, or a sugarcane field or some other agricultural use or for marinas or places for people to live, any of those uses, people typically see just what's gained by the conversion, not what's lost. Mangroves provide a wealth of ecosystem services: a nursery habitat for economically important shrimp or lobster or crabs or fish; adult habitat for birds. They trap sediment and the microbes in the sediment filter and detoxify sediments. They trap sediment that otherwise goes on to coral reefs and destroys them. They provide barriers against coastal erosion and buffers from tsunamis or big storms. A wealth of benefits that are not usually thought of. You know, they're just that stinky old mangrove out there. Let's get rid of it. But each different ecosystem has a series of benefits that it provides by virtue of the interactions between the plants, animals and microbes in that system. Understanding what the trade-offs are will help us make better decisions. It's not that one is right or wrong. It's not a value judgment. It's just having better information to understand not just what are you gaining, but what are you losing? What amount of mangrove do you need to retain those services? Those are interesting and immediately socially relevant questions. Paul Voosen: Now that you're on the side of being a policymaker, and these kinds of ecosystem service models are out there continually being refined, is there a balance you have to strike in adapting the latest science versus a concern that, it's not quite solid? Jane Lubchenco: So, NOAA is obviously a science agency. Jane Lubchenco: And it's just a really cool mission to discover and use science to save lives, enable commerce and promote healthy oceans and coasts. But it is grounded in the science. And we strive to respect that science, to be cognizant of the newest, latest findings, but to make decisions based on the best available science is sort of the lingo that's codified in legislation for Magnuson [the Magnuson-Stevens Act], for example. That's done in part by having good scientists in the agency, by staying in touch with the academic community and other scientists and being part of the global academic community. Paul Voosen: How are you changing the conduct of science at the agency? Jane Lubchenco: Yes. I'm proud that we've established NOAA's first-ever policy on scientific integrity. The intent there was to both protect scientific information and scientists, protect the information from being manipulated or distorted or cherry-picked, and protect scientists from undue political harassment. At the same time, we wanted to create an environment that is respectful of science, that enables scientists to have vibrant careers in the agency, to be promoted for their science, not just their ability to be good managers. Creating the scientific integrity policy gave us an opportunity to have an in-depth discussion within NOAA -- an inclusive, deliberative discussion about the environment in which science can thrive and how do we protect that? How do we enable that? One reason that I agreed to come here was that I had such deep respect for NOAA and for its mission. There are superb scientists at NOAA and have been for quite some time. This policy is designed to help them thrive, to make sure that we can have the next generation of scientists coming through and that the science that they're providing is not going to be distorted or squashed, suppressed, manipulated. Our policy has been called by others the gold standard. The Canadians recently called it the platinum standard for scientific integrity policy. It's a nice reflection of the process we used. It was open. It was very much a bottom-up process. Paul Voosen: I've talked with [U.S. Geological Survey director] Marcia [McNutt], and she mentioned that you're collaborating on a paper on lessons learned from the spill. Can you say what some of those lessons are? Jane Lubchenco: A little context here -- this spill was extraordinary in many dimensions. It required mobilizing so many people, doing so many different things. Just NOAA's part of it was so multifaceted, from doing spot weather forecasts to surface oil trajectories. Where is the oil going to be the next 24, 36, 48, 72 hours? To protecting the integrity of seafood, fishery closures, running oceanographic models to try to understand the behavior of the Loop Current, saving/protecting wildlife and habitat to the extent that we could. Using good scientific information about sea turtles or marine mammals, which are some of our trust species. So many different dimensions of the response. There was a mechanism for connecting to the press every day. We did daily calls with governors. We did daily calls with the Hill. What we never quite figured out how to do, and this is one of the lessons learned, is to have effective mechanisms for communicating scientific information to scientists. We held over a dozen workshops throughout the first year to share what different people were learning and doing that were invaluable. But, on a day-to-day basis, most academic scientists, for example, had to rely on what they read in the newspapers or heard on their radios or TVs. That was their source. Of course, they didn't believe half of it, because more than half of it was wrong. And there wasn't an easy mechanism for communicating across the breadth of disciplines that were interested or the breadth of scientists that were interested. I still am not sure what the best way to do that would have been. We didn't figure that out. It's important to do so. Paul Voosen: Would this be a call for rapid peer review or something like that? Jane Lubchenco: Not so much. That is a separate need. But this one is just sharing what do we know, what are we finding? We worked with a number of universities in the region to convene meetings and bring together researchers. And the folks who were there, when I would talk about all the NOAA stuff, they would say, "Oh, my gosh, I had no idea you knew that. I had no idea you were even doing that." And it's partly because -- having workshops intermittently is not the same as having daily updates that are scientist to scientist. And so that I think is a lesson learned. There is a need for rapid communication vehicles that are scientist to scientist, outside of the media. Not that they would be in secret, but you need to communicate scientist to scientist so you can talk in terms of specific findings. The same was true for proposing things -- to brainstorm ideas. We did involve a lot of academics where there were existing relationships. For example, quite a few academics came out on our NOAA ships to do research. Where there were relationships, those were activated immediately. That was hugely helpful in the interagency review teams that we set up to vet the science, integrate it across agencies and then share it with the principles and the national incident commander and the president. Those mechanisms, whether it was the flow rate technical group or the JAG, the joint analysis group, those involved academics. So it wasn't as if we didn't have academics actively participating. It was that we couldn't begin to satisfy the immense appetite out there for more in-depth scientific content across so many different disciplines. That was a frustration for everybody and it got us crosswise because people would criticize what we were doing without knowing what we were doing. And for not believing things, because they didn't seem believable, but, in fact, they turned out to be true. The need for rapid peer review was another need. Another one is the lack of integrated understanding of the workings of a large marine ecosystem like the gulf. And it points to the need, that many of us have been saying for a long time, to have ongoing, integrated, monitoring research and communication around a large marine ecosystem to understand how it changes in space and time. For example, within the Gulf, the flow in the open part of the Gulf is much better understood. When you get closer to the shoreline it's messy. Jane Lubchenco: That cross-shelf transport is a challenge from a physical oceanographic standpoint. And yet what we learned along the West Coast in the program that I lead before I came here was that you can put moorings in shallow waters and they give you a wealth of understanding. And the model that I favor is a consortium of universities along the coastline in a large marine ecosystem. Paul Voosen: Like the Integrated Ocean Observation System? Jane Lubchenco: Yes, but that system is mostly focused on physical oceanography. Jane Lubchenco: This would be much more interdisciplinary. It would be physical oceanography, ecology, microbiology, genetics and social sciences. To really understand how a system is working, not just what is the ocean current, you need to couple that with where do larvae go, where do they come from? And if you want to understand fishery biology or if you want to understand -- let's say, for the sake of argument, that the biggest impact of the spill was on the young larval stages of phytoplankton. You would like to have enough of an understanding of a system to be able to model what impact that would have. Jane Lubchenco: What I think we did was identify a number of areas where lack of information didn't prevent the response, but it would have been very helpful had we had more sophisticated understanding. And that's achievable. Paul Voosen: Since you joined NOAA, have you been able to continue your research work? Jane Lubchenco: I had to walk away from all of the research I was doing, all of my affiliations. There's a big bar that comes down. That said, I have continued to be involved in many of the scientific questions that I'm interested in, but also have had an opportunity to learn about a whole bunch of new things. That's been one of the fun aspects of this job. I never knew space weather existed, and I'm far from an expert on it, but I've learned a lot about it. And the same with earth weather as well. That's one of the great things about a science agency like NOAA. There's so many different kinds of science that are done here. So, I have continued to do more synthesis and analysis, but not with my former colleagues. It's been mostly focused on NOAA's appropriate purview, which is pretty broad -- oceans, coasts, weather, climate. Pretty broad. Paul Voosen: I know there's much with the National Resource and Damage Assessment in the gulf that can't be published yet -- but are you scientifically collaborating on that? Jane Lubchenco: So, I have not been in the field taking samples. I have been -- the NRDA team started working I think like on day three or day four. It was really early, thank God. Out there they started taking samples and have been busily at work. They brief me periodically on what they're doing and often ask for input on how they're thinking about the more integrated approaches. We've got a very talented team that's doing that. So I'm not an active part of that team. I can't be. Because I have to run an agency. But I'm intensely interested in what they're doing and what they're finding. Paul Voosen: Will this NRDA data be published at some point? Jane Lubchenco: I certainly would hope so. You never know what the outcome of a legal process is going to be. One of the great outcomes of the Exxon Valdez disaster was the creation of a mechanism to have ongoing science and monitoring in Alaska. That is a nice model and, of course, much of the understanding of the impact of the spill from Exxon Valdez has come only after. So not in the thick of the moment, but through time as processes were better understood. For example, the impact of oil on developing fish larvae and how it can have a devastating impact on development of circulatory systems in young juvenile fish. We have just begun to scratch the surface in terms of understanding all of the new things we're going to learn from this particular spill, so very different in so many different ways. There's active research underway and will be for years and years to come. Interview conducted and edited by reporter Paul Voosen.